The Mount Snow Valley is a four-season resort area. In winter, enjoy great alpine skiing at Mount Snow, three cross country ski centers, snowmobile rentals and the VAST snowmobile trail network, snowshoeing, ice-skating, sleigh rides, sledding, tubing, and the pristine and romantic charm of Vermont. In Spring, Summer and Fall there’s golf, two beautiful lakes for swimming or boating, tennis, mountain biking, hay rides, fall foliage, chairlift rides, shopping, antiquing, flea markets, hiking, and fishing, all in the lakes, streams and hills of the beautiful Green Mountains. Area Recycling is available for all homeowners and guests. There are two Wilmington locations with sets of 3 recycling containers (one for mixed paper, one for cardboard, and one for containers). Downtown on Beaver Street near the tennis courts (directions and hours below). Wilmington Transfer Station on Miller Road (directions and hours below). Please follow the list below and separate items into the proper container. 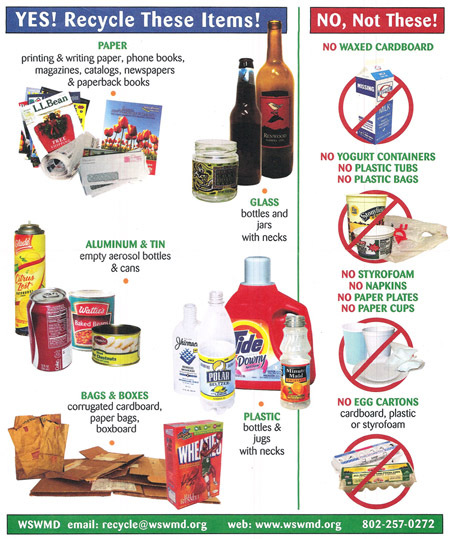 Do NOT put anything in the recycling container that is not listed below. When you deposit items that do not belong, you can contaminate the whole load, causing it to be land filled instead of recycled. This defeats the purpose and costs money. To Downtown on Beaver Street near the tennis courts and Twin Valley High School: Make a right at the traffic light in Wilmington. Turn left onto Beaver Street (the first left after the light) and follow to the recycling containers on the right. Hours: Open 24 hours. To the Transfer Station: From Route 100 north, turn onto Higley Hill Road just before the River Valley Market. Go about 3 miles and Miller Road is on the right. There is a sign for the Wilmington Transfer Station. Transfer Station Hours: Fridays and Sundays - 8:00 AM to 3:30 PM, Tuesday 12:00 PM to 3:30 PM.